At about seven in the morning over the territory of Enisey’s basin in Russia, from the south-east to the north-west there flew a big fire ball. The flight finished with the explosion in the altitude of 7-10 kilometers above an uninhabited area of taiga. The explosion waves were placed on record by observatories all over the world, including those in the Western hemisphere. As a result, trees were striken down on the territory of more than 2000 kilometers, windows were broken down hundreds of kilometers away from the epicentrum of the explosion. Several days after the explosion people could still see intensive glowing of the sky and glowing clouds in the territory from the Atlantic to central Siberia. Several expeditions were sent to the region of the disastrous accident. Starting from the expedition under the leadership of L.A. Kulik in 1927. No substance elements of the meteorite in any significant amount were to be found, however, there were found microscopic silicate lodestone balls, as well as heightened amount of some elements, proving the space-borne nature of the substance. It was also marked that even 3 days before the explosion, starting from June, 27, 1908 in Europe, the European part of Russian and Western Siberia there were noticed outstanding atmospheric phenomenon: silverfish clouds, bright twilight, halo visions. A British astronomer William Danning wrote, that in the night of June, 30 the sky over Bristol was so bright, that one could not see any of the stars, all of the northern part of the sky was red, while the eastern – green. In the morning on the 30th of June, 1908 there flew a fiery ball over Central Siberia, moving in the direction to the north, its flight was was seen in many settlements on that territory, there also hear some thunder-like sounds. The form of the meteorite body was described as round, sphere-like or cylindrical, the colour was described as red, yellow or white, there was no flue track following it, but some of the witnesses mention some iridescent stripes following the meteorite. At 7:14 according to the local time above the Yuzhnoye bog by the river Podkamennaya Tunguska the meteorite body exploded, the power of the explosion reached 40-50 megatons of TNT. 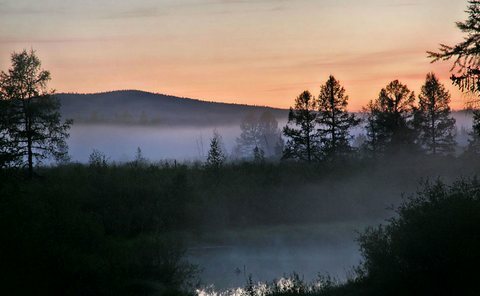 An exemplary plan of the expedition: visiting Mount Farenheit, Yuzhnoye bog, Kulikovskaya funnel, Afinogenov stone, Churimskoye clove, Churimsky waterfall and other mysterious and beautiful places. Also you will chesk some of the versions about the falling of the meteorite at the side of the investigated region.